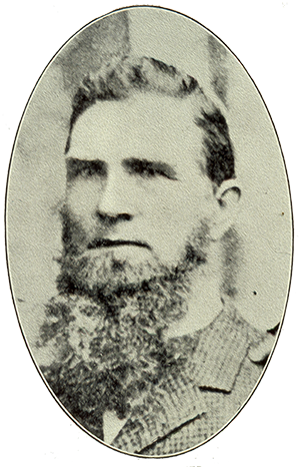 James Fletcher died suddenly, at the age of fifty-seven, in Melbourne on 19th March 1891. At the time of his death he was the Member of the Legislative Assembly for Newcastle. He was generally considered to be an advocate for miners' rights and was a popular and respected public figure in Newcastle. His body was transported to his home in Waverley and then transferred to Newcastle for the funeral. In Sydney, a procession of friends, mourners and spectators passed through Oxford St., Liverpool St., and George St. to accompany his coffin to the train station. At three o'clock in the afternoon the train reached Wallsend where the coffin, covered in wreaths of white flowers, was moved into the hearse and taken to the home of James Fletcher Jr. in Plattsburgh. James Fletcher was a Freemason; a member of Lodge Harmony, Newcastle, and St James Lodge, Plattsburgh, where he had reached the degree of Past Master. A Masonic service was held at the Mechanics Institute at Plattsburgh; after which Lodge members marched in procession to the home of James Fletcher Jr. Each member carried a sprig of acacia, the Masonic symbol representing the soul's immortality. The Newcastle Morning Herald's report on the Masonic procession stated: "When drawn up in line the body presented a fine sight, all the brethren being in full regalia, with their jewels draped in mourning. Each lodge marched in order, the junior one, the Star of the West, No. 189, Adamstown, being first. The following were the other lodges in their order:- Waratah no. 179; Fidelity, Newcastle, No. 163; Friendship, Lambton No. 158; Lord Carrington, Wallsend, No.149; Sedgewick, Wickham, No.125; St. John's, Junction, no.115; St George, Newcastle, No.75; Kilwinning, No. 54; St. James No.45; and Harmony No. 15." A Primitive Methodist service was given at the house by Reverend John Penman and the eulogy by Alexander Brown. Mr Melville M.P. also gave a short speech. The procession to Old Wallsend Cemetery included the Police; Members of Parliament; the Band of the 4th Regiment playing the 'Dead March in Saul'; the Wallsend Volunteer Infantry; all the Fire Brigades and Hose and Reels of the district; children from the local Public Schools and Sunday Schools; four hundred and forty four Freemasons from District and Sydney Lodges; the hearse followed by family members; a score of mourning coaches, and at least 100 other vehicles followed by mourners on foot. Mourners and spectators also lined the streets from Plattsburg to Old Wallsend Cemetery on Newcastle Road and it was estimated that the crowd numbered at least twenty-five thousand with the procession reaching from the Cemetery to the end of Devon St, Plattsburg. The coffin was interred with full Masonic honours. The oak casket was ornamented with silver Masonic emblems and bore the inscription "James Fletcher, died March 19, 1891, aged 57". Upon arrival at the cemetery the Freemasons formed a circle about the grave into which only the ministers of religion and the relatives were allowed. Bro. Robert Craig, Past Master of St James Lodge "commended his soul to the Great Creator of the Universe", and "Bro. John Estell WM of the same lodge followed, and then a lambskin, the Masonic emblem of purity, was dropped into the grave". Bro. T. Abel dropped a sprig of acacia on the coffin, and "a cloud of sprigs were dropped into the grave from all sides". 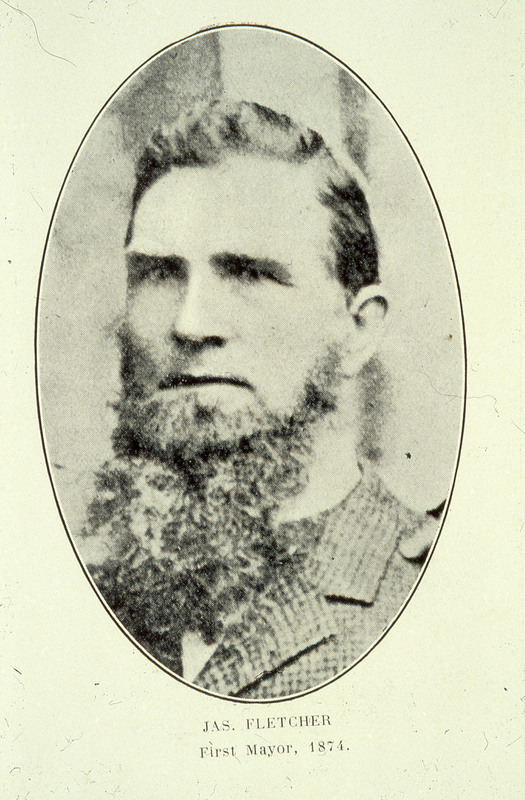 In September 1891, a correspondent to the Newcastle Morning Herald on visiting James Fletcher's grave, wrote: "On visiting the resting place of the late Mr Fletcher, I observed that several beautiful wreaths in large glass cases were placed on the grave, and in one of the cases is a splendid photo of the deceased gentleman." However, they also noted the dilapidated state of the Cemetery which had been vandalised and neglected. Old Wallsend Cemetery was closed in 1896 and converted to a public rest park in 1953. "Funeral of the Late Mr. James Fletcher, M.L.A." Sydney Morning Herald 23 Mar. 1891:6. Newcastle Family History Society. Old Wallsend Cemetery, New South Wales 1863-1896, Book 1. 2000:75. "The Death of Mr. James Fletcher, M.P. An Impressive Funeral." Newcastle Morning Herald 23 Mar. 1891:5. This image was scanned from a 35mm slide taken by the late Dr John Turner (1933 - 1998). It is held in Cultural Collections. It has been edited.